Hello lovelies! First of all, excuse my delay in posting less frequently than usual, I've had a rather busy week down south, travelling about the likes of London and Cambridge! This post will talk a little bit about that, and the well, mainly drugstore haul I collected! As Boots had a 3 for 2 offer on, I couldn't really say no - so I went a little wild with buying stuff! I always usually concentrate on buying clothing, however I thought I should delve into the beauty side of things a little more. I LOVE this highlighter, many bloggers have been raving about this and I will just add to that list! For a highstreet cosmetics brand, it's pretty good compared to higher end stuff. I was very tempted to buy YSL's touche eclat, however went for the cheaper option. I noticed that Boots had a 3 for 2 offer, which I of course, had to take advantage of! I've always wanted to get a primer too, and I find this leaves my skin looking glowing, even after applying foundation. At first, I was a little worried that the substance looked rather sparkly, however once it's blended in it just looks kinda shiny, and makes your skin look dewy and healthy-looking. Thumbs up L'oreal. I then bought my mum some 'English Breakfast' teabags from Harrods - they were literally like the cheapest thing in Harrods! hahaha! They cost £4.50. I actually didn't see much, as it was bustling with FAR too many people! It was insane! However I managed to pick up a gold-toned triange shape necklace, which are very on trend at the moment. I could see myself teaming it with a nice shirt or with a dress for a night out. At just £3.00, you can't go wrong. Of course, I had to check out Victoria's Secret whilst in London! I didn't expect it to be SO expensive though! It was something crazy like £50 for a bra. I wish. The store looked fab though. Bit slightly awkward that i'm just walking about in there with a Primark bag haha! Oh well. I wasn't massively impressed with Forever 21 though, don't get me wrong, it's a nice store and sells nice clothes and everything, however I just found it to be just the american version of H&M. Alright clothes for mediocre price - but costing the quality. Last of all, I know I sound like a sour puss, but I was SO disappointed with the hugeee, flagship Topshop in London. Yeah, awesome clothes, extortionate prices as always. However, the staff were SOSO rude!! I was searching for a shirt, so as you do I went up to a Sales Assistant and asked her if she could help me find it. However, I wasn't expecting her to snap back at me and say "I'M SERVING ANOTHER CUSTOMER!" before scuttling off leaving me astounded! I was literally so shocked at the customer service. And then not long after, me and my boyfriend were on the escalators and it was very nearly at the top and yet ANOTHER sales assistant shrieked saying 'Move, please!' you don't say that to customers! I know myself with being a Sales Assistant for 2 years. Sorry for my rant, but it's just plain rude! 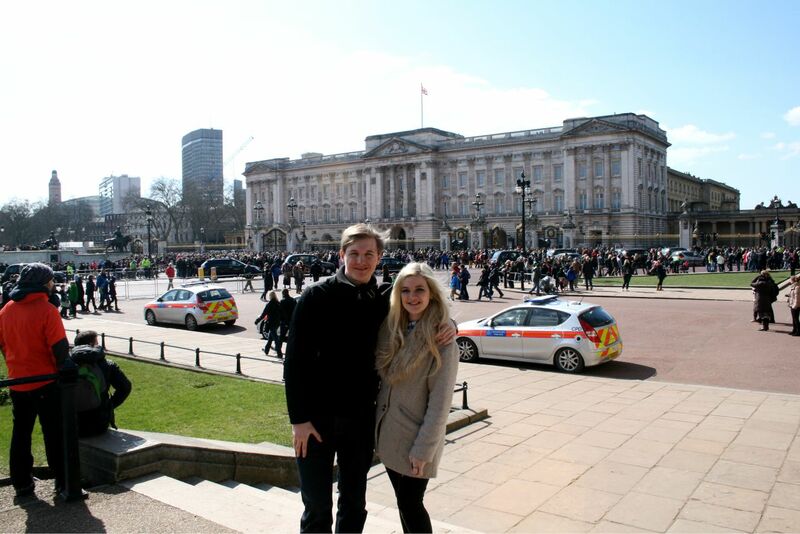 Anyway, I hope you enjoyed my post on London! Great post, I'm a new follower! Have a nice day & keep in touch! It's frustrating when sales associates are rude and you are ready to spend money in a store. I use to work in a clothing store and I'd never imagine speaking to anyone that way. Thanks so much for following my blog! I'm following yours now too!